Pure cocoa powder is one of the most beneficial and powerful natural appetite suppressants in the world. Respectively, dark chocolate, the one made of more than 75 percent cocoa powder inside is so beneficial and healthy – qualities which the milk chocolate will never have. Mix the cocoa powder with the cup of hot water in a large enough cup and stir very well. It can’t be any easier, right? Let the cocoa drink cool for a few minutes and drink it. Cocoa drink can substitute any in between meal snack – prepare yourself a cup of this amazing drink every time you have a food craving. You can do that up to 8 times a day – 8 tablespoons equal 4 oz., which is the maximum safe amount of pure cocoa powder consumption per day. Stay connected and don’t forget to subscribe for my newsletter. Is there a particular cocoa powder that is organic and healthy? 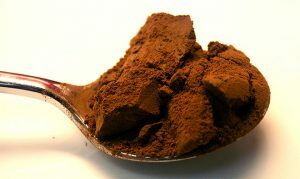 Is the only benefit for the cocoa powder drink to suppress appetite in between meals or are there other health benefits? What brand of cocoa powder do you suggest? Thank you.